LIFTING PEOPLE SAFELY TO NEW HEIGHTS! Lakeshore Industrial, Inc. manufactures personnel lifting platforms, Man Baskets under the trade name Custom Cage ®. 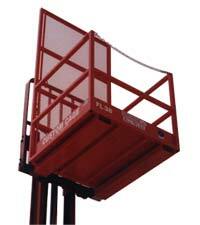 These work platforms, (manbasket) are available in a wide variety of dimensions and capacities. 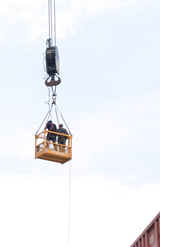 They are designed to be suspended directly from a crane hook or attached to a forklift. Custom Cages® are certified to meet or exceed all existing state and federal codes. Each cage is load tested prior to shipping. Custom Cages® are available in any size, shape or material to meet your needs. Lakeshore Industrial, Inc. builds the highest quality industrial platforms /manbaskets made. We are dedicated to building personnel platforms for cranes and fork trucks. Custom Cage® Think Safety! Our Custom Cages® set the standard’s in the industry. Manufactured in compliance with AWS D1.1 welding procedures, with high strength square tubular design. Custom Cages® are built in full compliance with OSHA 29 CFR Subpart CC Section 1926.1431 final rule and A.S.M.E B30.23. Our name speaks for itself Custom Cage®, we will custom design the cage that meets your needs, or choose from over 20 standard models.